The mandibular first molar (Fig 4-60) usually has a five-cusp crown with two lingual and three buccal prominences, which gives the tooth a long, rectangular outline. The roots are highly characteristic: there are only two roots, one anterior (mesial) and one posterior (distal). These roots are flattened and contain pronounced longitudinal depressions. The posterior root contains one canal; the anterior root contains two canals. The very large occlusal surface of the tooth enables it to withstand a large amount of masticatory pressure. The periodontium is correspondingly well developed: The roots mainly absorb sagittal forces but can also take transverse pressures because of the root flattening. The tooth is inclined slightly lingually, in accordance with the crown inclination. As the first accessional tooth, the mandibular first molar determines the height of the occlusion and the width of the dental arch at exfoliation. The vestibular (buccal) surface has the three ridge-shaped, rounded cusps that are divided by slight longitudinal grooves. The tooth recedes distally, in keeping with the angle characteristic. A pronounced longitudinal and transverse convexity can be seen in the cervical area, where there are also slight cervical grooves. The line of the cervix appears to be wavy. The distal contact point lies far more apically than the mesial one, so that the mesial approximal edge has a greater longitudinal convexity than its distal counterpart. The lingual surface is divided by a longitudinal groove; it shows both of the rounded, ridgeshaped cusps. The markedly smaller surface has only a slight transverse and longitudinal convexity. The cervical line is located more coronally on the lingual side than on the buccal aspect and is undulating. The lingual surface is slightly overhanging because of the tooth inclination. The approximal surfaces are rhomboid in keeping with the tooth inclination. The vertical curvature of the buccal surface is greatest cervically, whereas the lingual surface contour appears to be overhanging occlusally and displays no appreciable curvature.The buccal cusps are shorter and more rounded than the lingual ones. The distal approximal surface is considerably smaller. The contact points are overhanging. The occlusal surface is almost rectangular but rounded and becomes narrower distally. It is made up of five differently sized cusps, in order of decreasing size: mesiolingual, mesiobuccal, dis-tolingual, centrobuccal, and distobuccal. The features of the cusps are typical, as is the pattern of the grooves. The central developmental groove is divided medially by a distinct main developmental groove, which produces a cross. This is where the central pit is located. Distally another distinct main groove branches off buccally, which separates the distobuccal cusp. The central groove divides into pronounced supplemental grooves before reaching the approximal marginal ridges. 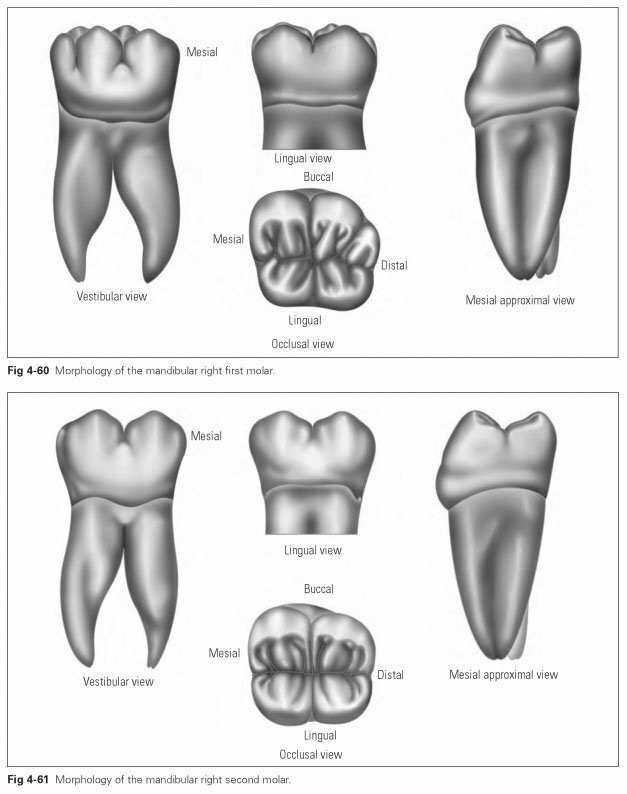 The mandibular second molar (Fig 4-61) is very similar to the first molar, except that it is smaller overall and has only four cusps. It is very symmetrically structured, with roughly equally sized cusps that are divided by a cross-shaped groove. There are some mandibular second molars that have five cusps. The mandibular third molar shows great variability. It can be found with four or five cusps but also as a three- or six-cusp tooth. It normally resembles the mandibular second molar but is rather smaller. Its roots are often fused, with separate root canals. In many cases, this tooth is ectopic and often has to be extracted during the eruption phase because it presses against the mandibular second molar as it grows and causes severe pain.